Oil made from the center of the wheat seed is high in vitamin E and contains significant amounts of niacin, folate, thiamin and potassium. Minerals inherent in wheat germ oil include magnesium, zinc, iron and phosphorous. Wheat germ oil also contains fat and protein. Healthy fiber is taken out when wheat germ is converted to oil. While wheat germ oil can provide healthy supplementation to your diet, you can consume too much. A 3.5 oz. serving of wheat germ oil contains about 178 IU of vitamin E. One cup equals about 4 oz. According to Dynamic Chiropractic, various nutritional agencies recommend anywhere from 15 to 150 IU of vitamin E per day for maximum health. Most American diets contain less than the minimum recommended dosage of vitamin E, leaving room for additional supplementation with wheat germ oil. Other dietary sources of vitamin E include sunflower and safflower oils, wheat germ, mayonnaise and soft margarine. Vitamin E is an antioxidant that protects the fat cells in your brain, tissue and nervous system. It protects the low-density lipids, or LDL cholesterol, from oxidizing and initiating the artery clogging process in your body. Antioxidants fight the effects of free radicals that come from the food you eat and from environmental sources such as air pollution, second-hand smoke and ultraviolet sun radiation. Antioxidants strengthen the immune system and help fight infection. Vitamin E is a fat-soluble vitamin that does not have negative effects for most people when taken in excess, although side effects can interfere with ongoing medical treatments. 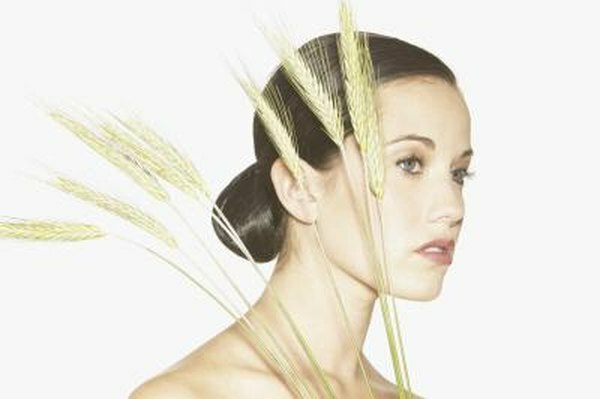 Wheat germ oil used externally on the skin can cause allergic reactions in some people. Extended use of vitamin E supplements such as wheat germ oil can cause bloating and gas, nausea, abdominal pain and flu-like symptoms. High doses of the supplement can lead to bleeding because vitamin E inhibits your platelets from clotting abnormally. Supplements may be particularly harmful if you take aspirin or blood-thinners such as warfarin. You should talk to your doctor before starting wheat germ oil to supplement your diet to make sure it won't interfere with other treatments you may be undergoing. Vitamin E deficiency is rare and is not directly related to any easily detectable diseases. Chronic malnutrition and digestive absorption disorders may lead to a deficiency. The upper recommended dosing to treat malnutrition in adults is 1,500 IU. For children under the age of 18, maximum dosing for treatment of a deficiency ranges from 300 IU for children from 1 to 3 years old, to 1,200 IU for teens 14 to 18.